Debbie Wasserman Schultz better hold on tight Tuesday night. It's going to be a bumpy ride. Democratic National Committee (DNC) Chairwoman Debbie Wasserman Schultz (D-Fla.) predicted Sunday that her party will hold the Senate in Tuesday's midterms thanks to its "superior" ground games in key states. 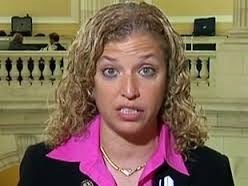 "I think we're going to hold the Senate," Wasserman Schultz said during an interview with ABC's "This Week." "We have a ground game that I know [the GOP] would take over theirs any day of the week. "Wassermann Schultz also cited the high-level surrogates working with Democratic candidates on the campaign trail, including former President Bill Clinton, former Secretary of State Hillary Clinton and Vice President Joe Biden. Noting close poll numbers in key states, she said the Democratic party's advantages are "superior to the ones that Republicans have."